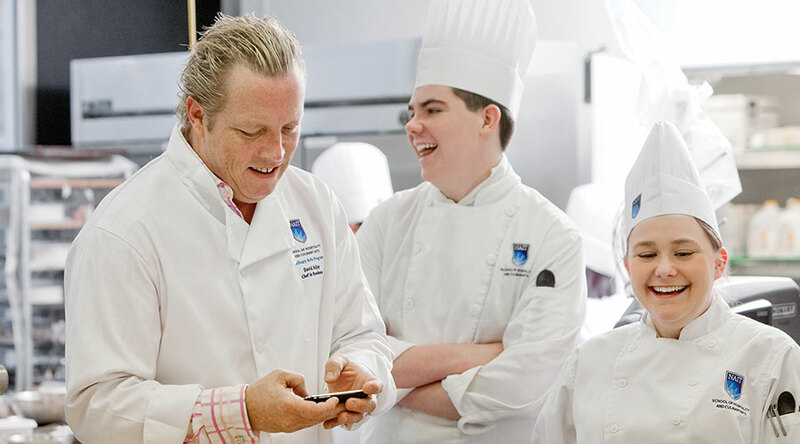 Once the personal chef of Dan Akroyd, Adjey still considers himself a "blue collar guy"
Along with his entertaining style and cooking philosophy, chef David Adjey gave some unorthodox advice to 250 culinary students as NAIT’s Hokanson Chef in Residence. After years spent running top hotel and restaurant kitchens in Canada and the United States and a stint working as Dan Aykroyd’s personal chef, Adjey has established himself as one of the most colourful chefs on television. He was one of the hosts of Food Network Canada’s Restaurant Makeover for seven seasons and is launching a new show, The Opener, this fall. Once the domain of the weather channel, Adjey believes food television has become the background noise in many of our lives, bringing the comfort of someone cooking into our homes and changing people's perceptions of chefs. He says he still considers himself a bluecollar guy, while admitting television has turned chefs like him into well-paid public figures. 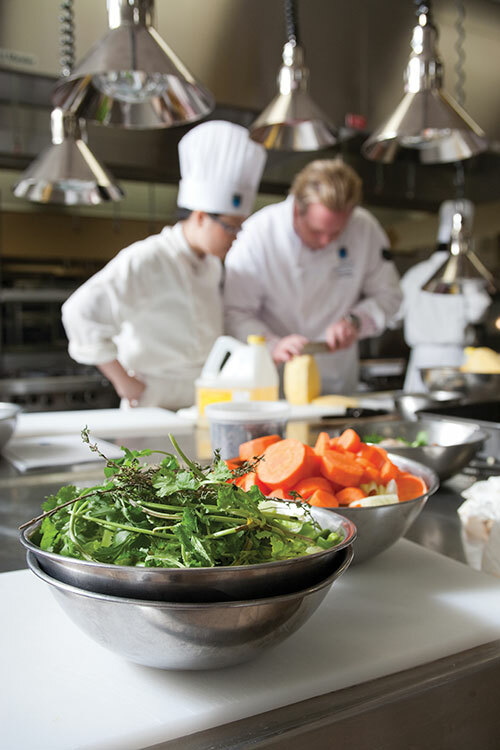 NAIT’s newest Hokanson Chef in Residence talked to techlife about all things Adjey. Describe a great day in the kitchen. The two years that I had my restaurant (Nectar, in Toronto) was pretty much fun every day. I had a menu that had no words on it to describe any of the food. The menu read, “Tuna: cool, warm, hot; duck: pot, pan, hook; lobster: tail, body, claw.” I would go to the market every day and create this very small menu of seven appetizers and seven entrees. I would come into the kitchen at two in the afternoon when all my cooks were in. I would say, “OK guys, we’re going to make this, this and this,” and we came up with a lot of amazing stuff . . . and a couple of things that were just terrifying! Dante Rota. He was the godfather of Italian cuisine in Toronto. He was the one who got me to go to the Culinary Institute of America. New York chef Richard Krause, one of the creators of Californian cuisine. Also, New York chef David Burke. People describe David Burke as the only person they know wilder than me. My loft is like a mad scientist lab – I’m constantly puttering with something and I end up eating my experiments. I’ll go to the Chinese supermarket and get a ling cod and play around with it a couple of different ways. I cook a lot of lobster. I made chicken-fried duck recently – duck confit fried in a buttermilk batter. I tried a lot of weird things. My dad was a salesman, on the road all the time, so we ate in restaurants a lot. I remember the first time I ate periwinkles (snail), rabbit, turtle, snake. If you could invite any three people to dinner? Anthony Bourdain (American chef and author of several books, including Kitchen Confidential: Adventures in the Culinary Underbelly), Georges Auguste Escoffier (pioneering French chef who died in 1935) and my cleaning lady – because after eating with those two guys I wouldn’t want to clean up. It would be a celebration of one ingredient depending on what was available that day. 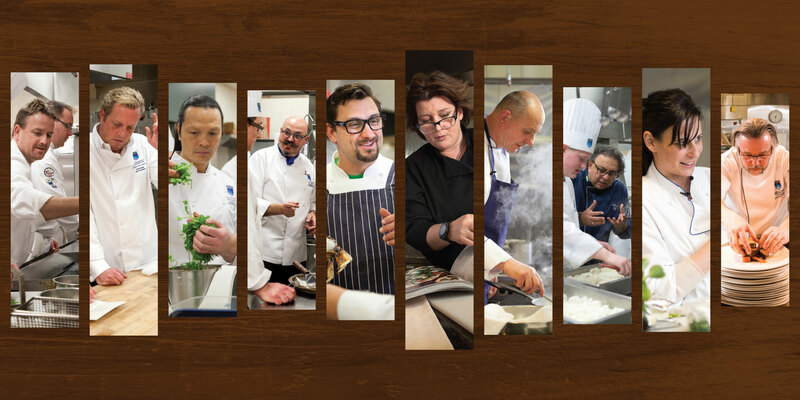 What separates the best culinary schools from the rest? The students. If you can get a bunch of charged individuals together, that’s 75 per cent of the battle. Best advice for someone considering a culinary career? Think about what else you can bring to the table. If you like photography, get into photography; if you are a great writer, be a food blogger. I tell my cooks that I want them to have a life outside the kitchen so they bring their experiences back into the kitchen and they’re fresh. That makes happy cooks, which makes great conversation in the kitchen, which creates new dishes. Biggest mistake made by novice chefs? Not taking the time to read the recipe and understand the instructions fully. Your philosophy on feeding children? We talk about our kids being picky eaters, but it’s not the kids at all, it’s what we put in front of them. My kids are terrified of fast food. There’s nothing in my fridge or pantry that’s processed. If they want cookies, we make cookies. We cheat our children with our busy lives. Taking the time to sit down for dinner is a priority at my house. Plans to get back into the restaurant business? Yes. I’ve been out of it for a couple of years now and I’m going crazy. I want to do something that’s fun and tie it in to my new show (The Opener) and to my philosophy that food has to have integrity, be ingredient-driven and doesn’t have to have a lot of pretention. I’m absolutely bonkers for Indian food. Consumers are being led to believe all aquaculture is bad, and that’s just not the case. There are fish farmers in this country who are doing it well, whether it’s trout farms in Quebec and Ontario or salmon farms in Atlantic Canada. Just like cattle, there are good and bad farmers. Without sustainable aquaculture, we’re going to go hungry. Julia Child is a demigod of American cooking. Julia Child, James Beard (American chef, author and cooking school founder) and Craig Claiborne (former New York Times food editor and cookbook author) – these are the people who started the American food revolution. You were a personal chef for Dan Aykroyd – tell us what that was like? It was the most fun you can imagine. I cooked in his log cabin north of Kingston, Ont. I got tipped a car from Dan when I moved to California. Dan has a huge car collection, and one of my favourites was a ’66 Impala. He made someone drive it from Kingston to the front driveway of the hotel I was working at in Santa Barbara, Calif., which is about 4,500 kilometres. It was cool because I gottipped a car, but even better because here’s this kid from Canada running this top hotel kitchen in America, and I instantly got the street cred from everyone else at the hotel. Made the consumer smarter. People are so empowered by information. You can’t pull the wool over people’s eyes anymore. What is the most common error you saw on Restaurant Makeover before you stepped in? Lack of cleanliness, and clutter. It takes away focus, and if you take away a cook’s focus, food can be wildly inconsistent.